Verified high-quality South Tyrolean holiday – so that nothing stands between you and your sense of wellbeing. An extensive program of activities and spa options await you, allowing you to fully enjoy the most delightful time of the year. Vitalpina’s Staying Active concept means being proactive in diverse ways: physical movement outdoors, immersing yourself in nature, active and introspective downtime. At least three guided hikes a week. At least three opportunities to do more gentle sporting activities in a natural setting. Our experienced hiking guides lead the hikes. Our program of activities varies in difficulty and length. We, as your hosts, accompany you on your hikes or program of activity at least once a week. Our free equipment rental includes backpacks, walking sticks, snowshoes as well as maps and informational materials. Upon request, we offer a drop off and collection service to the start point of individually planned hikes. 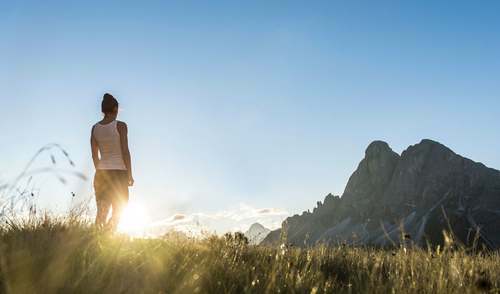 We present our hiking and Staying Active program to you personally, once a week. We offer expert advice for individual tours. Our library with hiking guides and maps are of help to those planning individual hikes. The Vitalpina® hiking map contains at least 25 itinerary tips in the local area. We provide expert information on hiking and Staying Active program, on current weather developments as well as on public transport. Vitalpina cuisine stands for wholesome and environmentally focused nutrition and for conscious enjoyment of easily tolerated, regional dishes using seasonal products. We use and label regional and seasonal as well as biological products. We guarantee fresh bread from the bakers daily. We offer an alternative vegetarian menu daily. We take into account allergies and intolerances and offer healthy and diverse alternatives. You'll find we have at least 20 different high quality wines from South Tyrol and five homegrown distillates. There are reading materials and cookbooks on environmentally aware and healthy nutrition in our library. Our daily Vitalpina® dish is healthy and light, made from homegrown and seasonal products. It's not only good for our food! We stay for use of traditional methods of regeneration and natural, Alpine products sourced from South Tyrol.